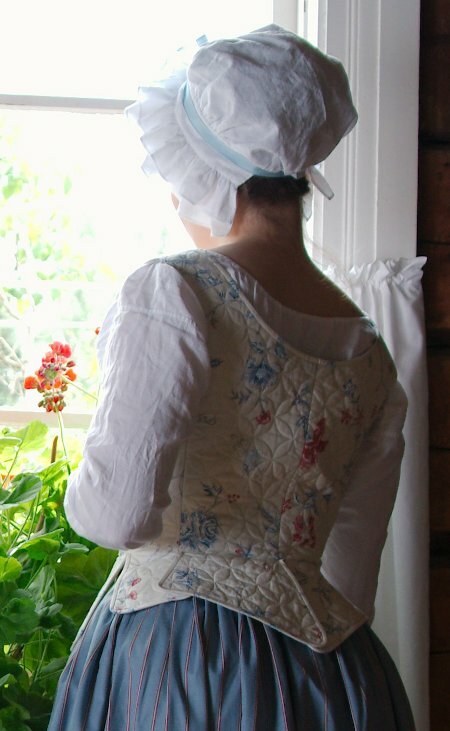 "Jumps" are a bodice or waiscoat which is often quilted. They have little or no boning, and were obviously used even by fine ladies as comfortable, relaxed wear in private, and also while indisposed or nursing. Quilted jumps could also be worn underneath stays for warmth. My friend Riikka has a beautiful pair of quilted jumps made of printed cotton, and after drooling them for a few years I finally decided to make a pair of my own. Apart from being cute, jumps are also a nice alternative to stays for period events with a more relaxed or lower class dress code. I was also in the mood to make something nice fast by machine. 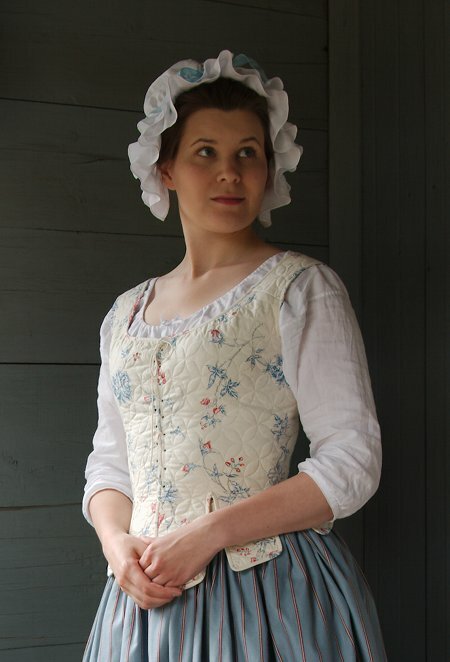 I had some of the pretty printed cotton left from my polonaise, and this was the perfect occasion to use some of it. Okay, luxury material such as printed cotton may not be quite lower class, but then again there was a huge market for second hand-clothing (or materials from them) might eventually end up on less well-to-do wearers. I also found from my stash a piece of heavier cotton-blend for the lining. 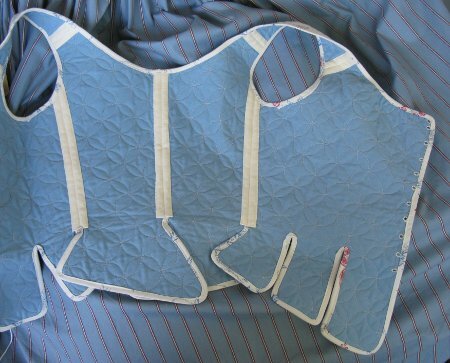 The batting is quilter's cotton batting which can be lightly fixed to top- and botton material by ironing. It's fabulously handy, also recommended by Riikka who sold me a spare piece she had left. She also lent me a plastic sabloni of the stitching pattern. I began by marking the edges of the pieces on the lining with pencil. Then I marked the stitching lines with the sabloni. I cut the pieces separate but still leaving large allowances around them at this point. Then I ironed the lining, the batting and the top material together. And then it was time for stitching. After finishing the first piece I began thinking that the stitching pattern looked kinda scarce, as the period quilting patterns were usually very dense. Then I realized that the pattern could be doubled by placing the sabloni between the original lines. Happily I had stitched only the first piece, so it was easier to add the additional stitching lines to the other ones. I had imagined that stitching a few small pieces would go very fast even though I had just just doubled the amount of work. Well, it took much longer. It didn't really matter, though, as I didn't have any hurry with finishing the garment and I really like machine sewing. 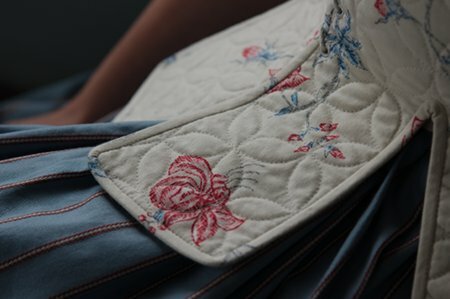 I did, however, begin to have second thoughts about my dream of making an elaborately stitched quilted petticoat some day. I extended the stitching a bit over my marked pattern edges just in case. For the last thing I stitched the pattern edges and then at last cut out the pieces, still leaving some extra seam allowance. That turned out to be a wise move, since when trying the jumps on I realized that due to the sturdier lining they had less stretch than Riikka's pair, and the stitching may also have caused them to shrink a bit. I added a bit on the front edges to get them to close. I also shaped the front edge slightly to achieve a better fit, though I'm aware this may not be period correct at all. I covered the seam allowances on the inside by a cotton tape, and finished the edges with (once again not period correct) bias cut tape of the printed cotton. The binding is done by machine as with no boning it's possible even on the slits between tabs. Making a pair of jumps was a very nice little therapy project, and it was mainly finished in a short time. I worked the hand-bound eyelets later. Like I've already said, I really like machine sewing, and sometimes it's nice to throw something together quick. 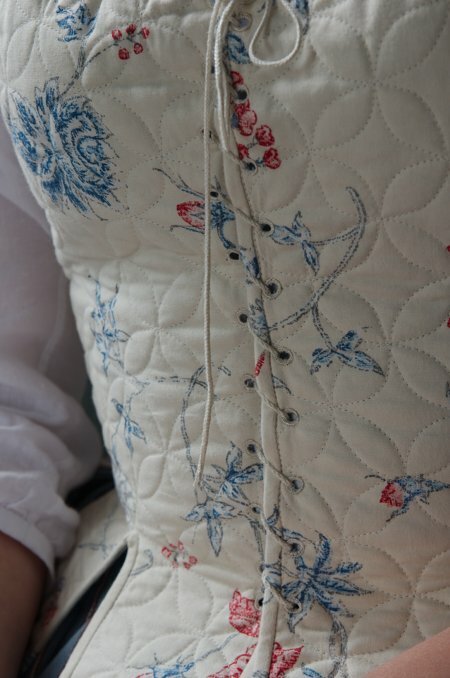 I'm usually very reluctant to let any machine stithing show on the outside on period garments, so it may seem a bit odd to make one with glaring machine stitch all around combined with hand-bound eyelets. The thing is that I'm not likely ever to have the time and patience for a hand-quilted garment, and, strangely, even machine quilting looks vaguely period from some distance. 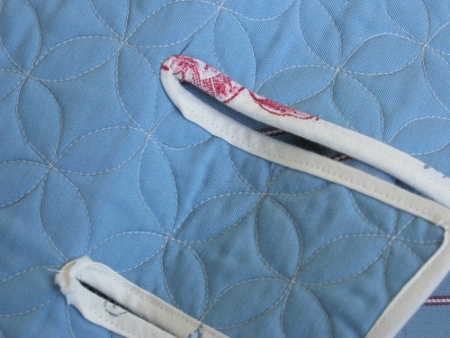 The three-dimensional texture created by the quilting also shows nicely on the light material. I had the additional luck to come across a dirst cheap striped cotton for a skirt to wear with the jumps. Unlike usual I even finished the hem by machine, even though it felt very wrong at first. In the end it doesn't really show unless you take a quite close look. I had originally planned to wear the jumps in the place of the stays, but as the narrow tapes of the heavy skirts digging into your waist are not that comfortable either I have also worn them over loosely laced stays. I have worn this cute outfit on events like a Tavern-party or a military camp, and it would also be suitable for helping in the kitchen, as it's cool and machine washable.